Noida: It’s time for sweets, lights, and celebrations! As India Rejoice the birth of the Natkhat Nandlal with festivities galore.Janmashtami, the festival that commemorates the birth of Lord Krishna is celebrated throughout the country. Janmashtami will be celebrated for two days this time, The festival for krishna birth celebration was celebrated on Sunday in some parts of India and in most parts it’s being celebrated today. On this special occasion the temples are decorated, and markets prepared throughout the country. On Monday, Lakhs of pilgrims paid obeisance at Iskcon Temple in Noida. 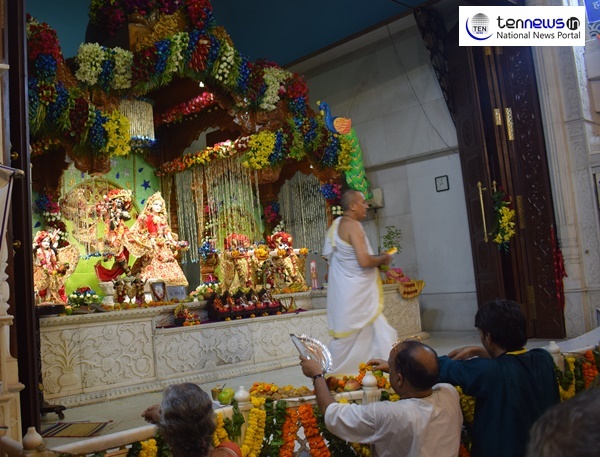 Where temple has been decorated like a bride.The energy, grandeur and devotion of the people present at Iskcon Temple in Noida on Janmashtami day is highly infectious.The entire temple has been decorated with lights. This time with the estimation to have 4 lakh pilgrims, Janmashtami celebrations here in Iskon Temple keep getting bigger every year. Arrangements were made to ensure safety of the people. More than 250 policemen are posted to protect lakhs of people coming on the occasion of Janmashtami. One Thousand guards and volunteers are also present as Iskcon temple to observe Janmashtami celebrations with festive enthusiasm.